If you had one hour to live and could make just one phone call, who would you call? What would you say? And why are you waiting? - To Kris, the love of my life, on our eighteen wedding anniversary. Love, Richard. 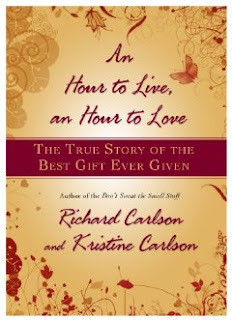 Richard Carlson was himself an inspirational author though I've never read his works.And while death may have now do them part, Kristine carries him in her heart always. In this way, she believes that love does last forever. The loss is painful but carrying on needs courage and I salute her for that. As she put it, "..as I vow never to sleepwalk through life again. When it is said that life goes on for the living, we should correct this statement by saying life goes on for the living who are fully awake." Overall the entire book can be summarized in one of Richard's favorite poem, Tomorrow Never Comes, by Norma Cornett Marek. I would tape each word and action, and play them back throughout my days. Take time to say "I'm sorry," "Please forgive me," "thank you" or "it's okay."